Coming Home: A Soldier's Project explores the uneasy transition between military and civilian life in Spokane. Regardless of the duration or intensity of a deployment, the return to civilian life after active military service is a marked and sometimes unsettling transition. Spending months or even years speaking a different lingo, working by a different timetable, shouldering different responsibilities and living under radically different conditions is an experience that can profoundly change the way a soldier sees the world. Yet it's a singular, hard-won vantage that's rarely comprehended much less shared by those who have never been soldiers themselves. 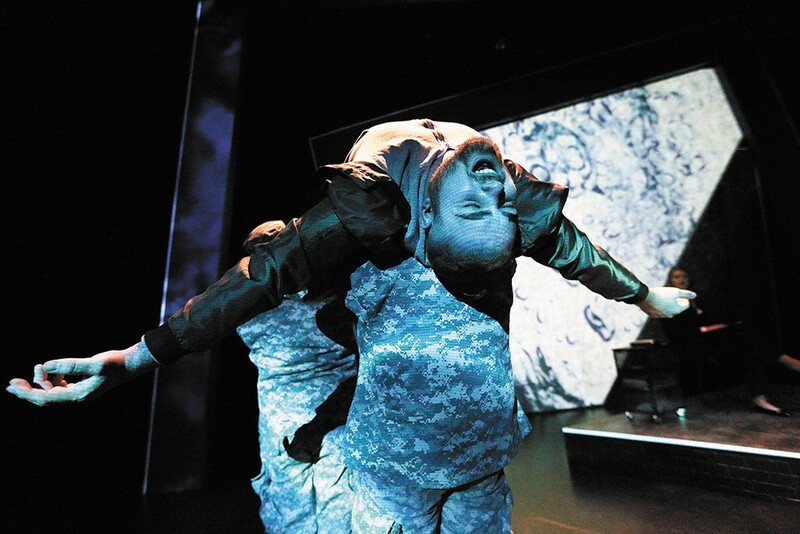 Rather than trying to distill the full experience of deployment into one performance, a new theatrical production called Coming Home: A Soldiers' Project is instead dramatizing the frustrating, alienating and discomfiting effect that the transition between military and civilian life can have on service members. Written by Kathleen Jeffs, chair of the Department of Theatre and Dance at Gonzaga University, and directed by assistant professor Charlie Pepiton, Coming Home can trace its origins back to a multi-year veteran survey project led by Gonzaga psychology professor Anna Marie Medina. During the interviews, vets were asked questions such as, "What's the first thing you did when you came home?" and "In what ways are home and family life different than before you were deployed?" "The project started before I came to Gonzaga, and it was called The Oral History of Homecoming," Jeffs says. "Basically, Anna Marie really got passionate about interviewing veterans from Iraq and Afghanistan and a few from Vietnam who were connected to Gonzaga in some way, or part of the Spokane community. She was really interested in zeroing in on that moment when [they] first came home from deployment." When Jeffs arrived at Gonzaga in 2012, Medina approached her and suggested that the project — 40 audio interviews in total — might offer rich source material for a dramatic interpretation that could help bridge the perception gap between returning soldiers and the civilian society into which they're reintegrating. "I was like, 'Heck, yes. This is absolutely an amazing opportunity for something dramatic, whether it's a play or we just read excerpts.'" At the same time, Jeffs felt that the development of a full-scale theatrical production called for more than one person. "I knew that I wanted to write it but I didn't want to direct it. You need two minds on something like this, two different filters to do it justice. Then Charlie joined the faculty and I suddenly thought, 'I think we have a director for this piece.' Charlie comes with a physical theater background, which I felt the piece really needed." In the fall of 2016, students in Jeffs' playwriting class were tasked with sifting through the interviews and creating scenes and characters based on the themes that emerged. Together they developed a script with heavily fictionalized elements that Jeffs later reworked back into more factual "verbatim interviews from the vets woven together into a play." Names were changed, sometimes genders, and a prologue of sorts was written to invoke Plato's allegory of the cave. Everything else was left more or less untouched. "I was really interested in working with a play where everything you hear, except for one paragraph right at the beginning, is directly from these veterans who'd been deployed and then came back to school at Gonzaga," says Pepiton. Around autumn of last year, he and Jeffs started workshopping with students to "theatricalize these non-theatrical texts." The separate anonymous interviews were merged and refined to form eight "aggregate characters." Pepiton says this creative step remained true to the interviews because of certain consistencies between them. Pepiton points to terms like "delay," frequently used by the soldiers to describe distant videoconferencing with family and friends as well as the growing sense of culture shock on their return. Words like "wall" and "barrier" cropped up repeatedly too. "Poring through all the transcripts, you would never see those things jump to the surface the way they do in the show," he says. But what Pepiton says is most unique about Coming Home is its "immediacy" and its "hyper-local" roots in Spokane. The original print version of this article was headlined "Battle Scars"